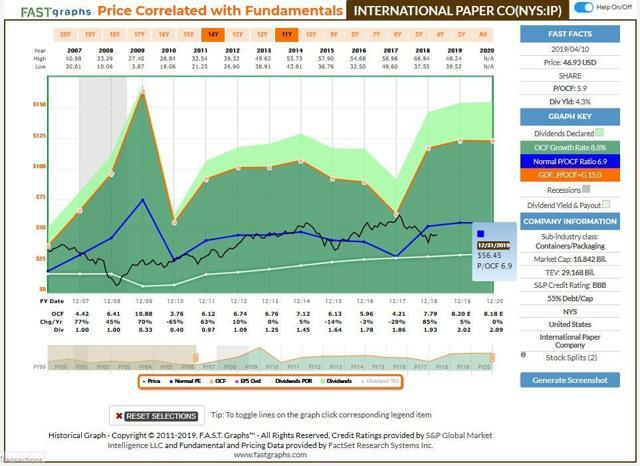 Dividend investors seeking high income without chasing yield may wish to consider shares of International Paper. Management does a good job running a relatively mundane business. No dramas. Currently, the dividend yield is 4.3%. The stock appears undervalued. Historically, the company experienced steep cyclical highs and lows. Senior leadership has moved towards a more stable business model. E-commerce and developing markets' demand for fiber-based products are outstripping a secular decline in traditional coated printing papers. International Paper (NYSE:IP) is one of the world's largest fiber-based packaging, pulp, and paper manufacturing businesses. It is the paper-recycling global leader. The company is headquartered in Memphis, TN. International Paper stays out of the limelight, drawing limited attention from Wall Street or Main Street. Yet, this old-school business capitalizes upon some very modern trends: the rise of e-commerce, requiring all manner of cardboard boxes and bulk packaging; and the growth of the Chinese economy, driven by the sheer number of people in its rising middle-class. Indeed, China is short on domestic forests, compounding the country's need for imported material, whether it be recyclables or finished products. In recent years, management worked hard to reduce the cyclicality of the business. The business model includes planning through the full economic cycle, instead of riding boom-and-busts. By divesting and acquiring certain integrated businesses, ex-CEO John Faraci and his successor, Mark Sutton, have enabled the company to position itself for more stable, sustainable performance during the next downturn. Management seeks to be a low-cost provider, leveraging International Paper's superior global span and scope. Hand-in-hand is a keen emphasis upon operational excellence. The financials are sound. The company is focused upon delivering strong free cash flow. The current 4.3% dividend yield is strong. The stock appears to be undervalued. The Industrial Packaging segment is highlighted by North American operations. Boxes (containerboard), packing materials, and food packaging drive results. Over two-thirds of the company's total adjusted EBITDA is derived from this business unit. The business is growing. 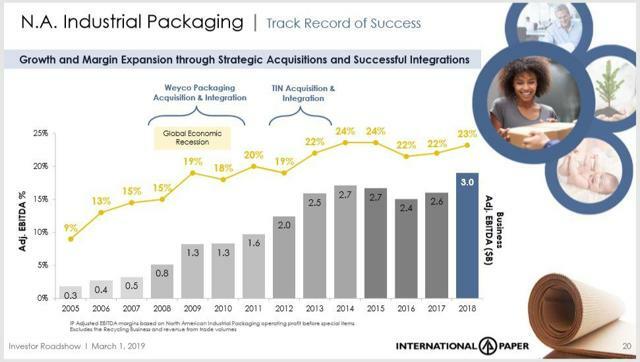 Industrial Packaging records the company's highest segment margins. 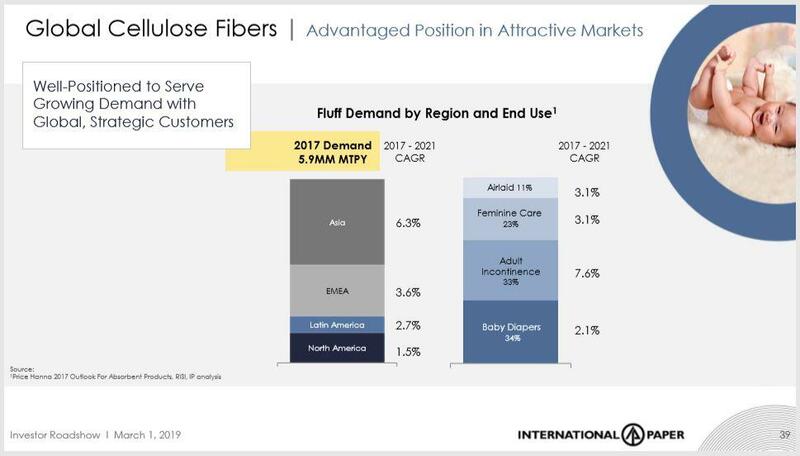 Recently, Global Cellulose Fibers were divided into its own segment. Management focused upon increasing the segment's manufacturing capacity via direct capital investments and indirectly through the Ilim joint venture located in Siberia. Ilim is a 50/50 JV between IP and Russian interests. A few years ago, S.A. editors published an article I wrote about IP, indicating the Ilim JV was an ace-in-the-hole. The premise was proven to be correct. Ilim not only contributes material equity earnings, it now pays a cash dividend, too. In 2017 and 2018, the Ilim JV paid International Paper dividends totaling $133 million and $153 million, respectively. Last year, Ilim added $0.38 (or about 10%) to the company's free cash flow per share. International Paper enjoys an advantaged position in the global cellulose market. Along with Industrial Packaging, it's another growth engine. Conversely, the Printing Papers segment faces secular decline. In today's electronic age, there's simply less demand for freesheet paper. Nonetheless, International Paper saw 2018 year-over-year revenue growth here, and management continues to report good margins for the group. In 2018, Printing Papers generated 19% of the company's total revenue. The company exhibits solid financials overall and exceptionally good free cash flow. Management does not have full control over stock prices. However, they do have a great deal of control when it comes to improving net book value. Debt is higher than I'd like to see, largely due to recent years' strategic and acquisitive activities. Senior management is well aware of the fact and pledged to rein in the debt. 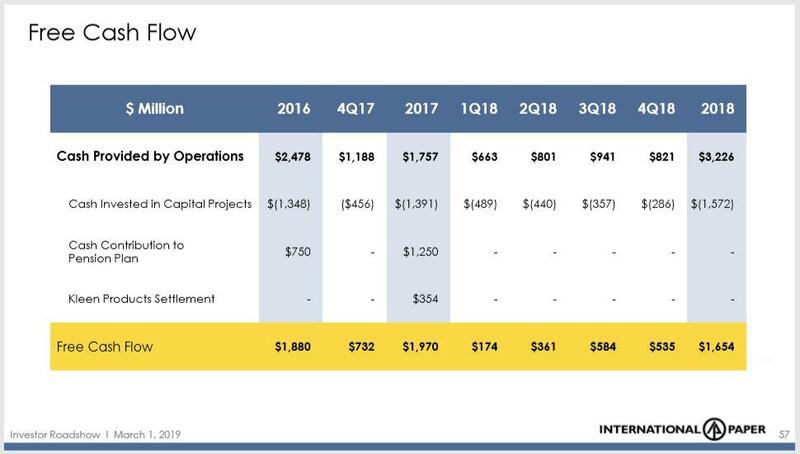 2019 balance sheet debt is forecast to come down by ~$500 million. For full-year 2018, net debt-to-equity fell to 136% from 155% a year earlier. EBITDA leverage is targeted between 2.5x and 2.8x. At the end of last year, the mark stood at 2.8x. The interest coverage ratio is quite good: just under 5x. Meanwhile, revenue peaked in 2013, then drifted lower for a couple of years; however, sales rose smartly between 2016 and 2018. Last year, the top line grew 7.2%. Fresh revenue, coupled with keen cost control, helped improve margins. Comparing 2018 and 2017, gross margins rose 130 bps to 33.2%, while adjusted operating income margins rose 180 bps to 12.9%. Unquestionably, management focuses upon returns, and in particular RoIC. 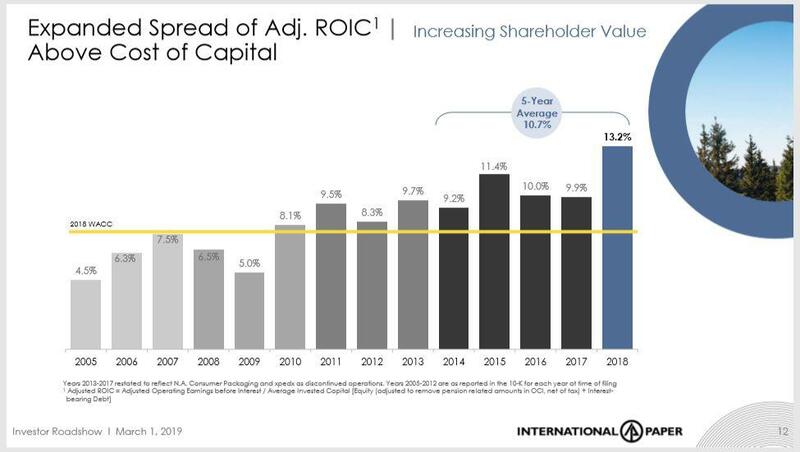 For the past 9 years, adjusted RoIC beat International Paper's cost-of-capital; reinforcing senior leadership is creating shareholder value. 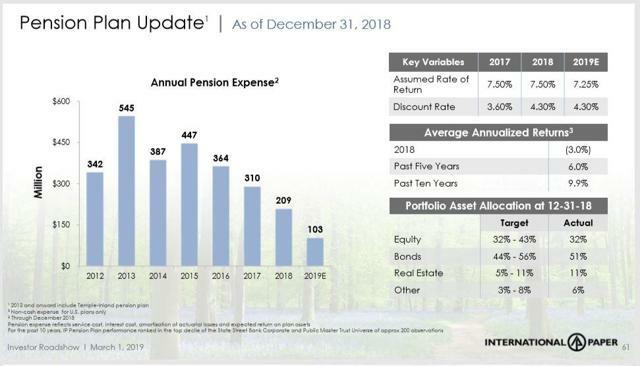 Over the past 5 years, RoIC averaged 10.7%. But the real post-transition story is cash flow. A major prong of International Paper's business model is the quest for rateable cash flow. This cash flow translates into a big dividend, yielding 4.3% currently. The payout's been raised the past 7 consecutive years, and it's nearly doubled since the Great Recession. Expectations are the dividend won't get cut during the next economic downturn. However, to be fair, management indicated the payout is likely to remain flat in 2019. Debt repayment is on the front burner. Indeed, IP generates prodigious operating cash flow. 2015 to 2017 cash flow declines are somewhat misleading. Primarily, it was due to the company voluntarily paying down the pension shortfall. This included payments of $750 million in 2016 and $1.25 billion in 2017. Adding these payments back, IP has been booking over $3 billion OCF a year consistently. Run-and-maintain capital expense burns about $1 billion a year, with the capex balance going toward strategic growth projects. Management is conservative and gets results. For nearly a decade, International Paper recorded RoIC greater than its cost of capital. Resultant strong free cash flows feed a balanced capital return program. The current dividend policy targets distributing ~40% of the company's free cash flow. In the event of an economic downturn, this provides the board of directors a considerable margin of safety in order to keep the dividend intact. The objective is to maintain the dividend through the cycle trough and seek to raise it during high times. In addition, the company knocks back ~1% of its total diluted shares outstanding annually. Part of the investment thesis includes an attractive valuation. Indeed, International Paper shares appear discounted. F.A.S.T. graphs offer a pictorial view of the historical price-and-earnings relationship. I've selected a time period beginning in 2007, immediately preceding the Great Recession. International Paper is a Materials sector "smokestack" stock. Consequently, prospective investors should consider many securities within the sector experience P/E contraction towards the end of the cycle and P/E expansion after emerging from periods of stagnant growth or recession. International Paper fits the mold, now registering a 9x multiple. Examining P/E ratios over many years and considering the aforementioned, we see shares still look inexpensive. The full-year 2018 trailing operating earnings multiple settled at 7.6x, the lowest annual P/E since 1999. The current P/E remains below the 2008 mark. Personally, I prefer to value IP on a price-and-cash flow basis. We find the historical P/OCF mark is ~7x. Peak cycle cash flow per share is pegged about $8. This suggests a $56 peak FVE. Shares rose to this level a few times in 2017 and 2018, indicating we touched the cyclical peak; indeed, we very well may be past it. 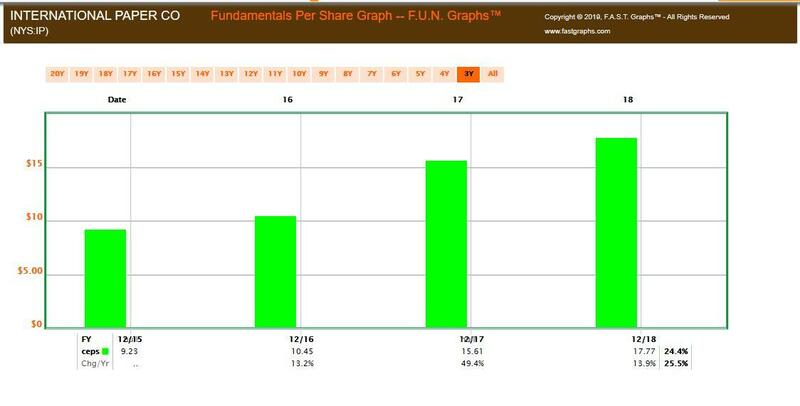 If the stock rises to $56 again, it offers 20% capital appreciation upside, plus a >4% dividend yield. On the other hand, if one believes the stock is "rolling over" after reaching the current cycle peak, now may be the time to begin "pick at" shares but not rush to fill a position. While IP shares suggest value, bigger discounts may present itself if the economy is truly petering out. If that's the case, astute investors could continue to accumulate on subsequent weakness. If shares rise towards Fair Value without filling the coffer, that's a high-grade problem. In any event, patient income investors may appreciate the high dividend yield. Sans a major global recession, I contend International Paper is well-situated to maintain the payout. The growth of e-commerce and developing markets (like China) bode well for the company even in the event of generally slowing economic growth. 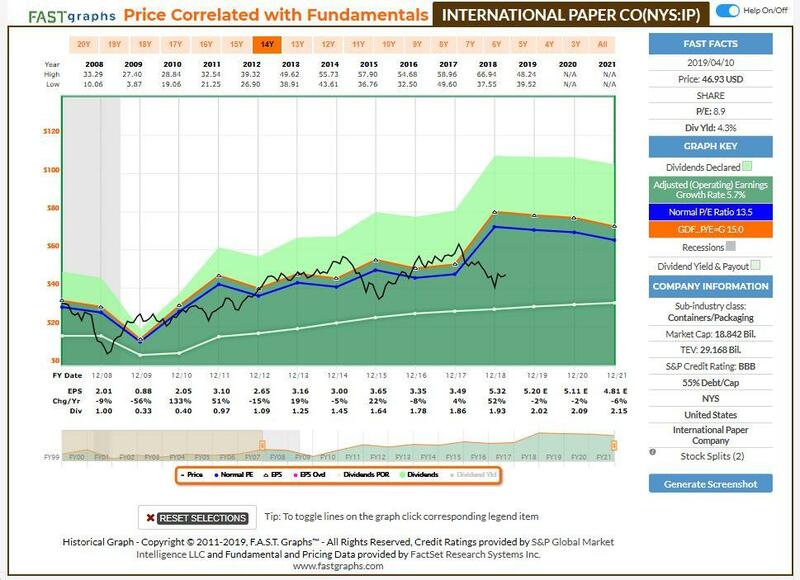 Importantly, I do not believe International Paper shares are a "buy-and-forget" investment. This doesn't mean I treat it like a short-term trading vehicle. I've owned IP shares for over a decade. No, the stock is a prime candidate for trading around a core position. Cyclical smokestack stocks are best accumulated gradually when disliked or ignored by the investment community, then distributed (always in stages, never all at once) during toppy price run-ups. By enlisting the aforementioned investment strategy, over time, I've removed my original share basis completely, thereby placing me in the enjoyable position of "playing with the house's money." Currently, given recent prices, I'm watching for opportunities to build upon my core position again. International Paper's two most significant competitors are WestRock Co. (WRK) and Packaging Corporation of America (PKG). I classify the paper and packaging industry as a relatively wide moat. Barriers to entry are high, especially for international players. China is attempting to improve its industry standing, though its lack of input material (wood) and hit-or-miss ability to locate factories in the best geographies hurt gross margins and post-production logistics. Forest-to-factory-to-market logistics are an important component of the paper and packaging industry. Last year, IP, WRK, and PKG stocks hit cyclical highs and have since retraced to current levels. Given a few clear exceptions, there's a limited degree of separation between these companies. All are well-run companies. By far, International Paper is the largest of its peers. Management's move into higher margin businesses, coupled with the company's greater global span, is the reason I prefer IP; but not by much. Presuming a stable global economy, International Paper's growth prospects are good. WestRock Corp. offers the highest dividend yield. The $4.8 billion KapStone Paper & Packaging deal closed in late 2018 and should be immediately accretive to cash flow. WestRock is a well-managed company, and management has demonstrable skills when integrating acquisitions. However, WestRock's product mix does not quite permit it to enjoy margins comparable to IP. Packaging Corporation of America is the smallest and the most richly valued. Nonetheless, this is another well-run, cash-rich business. However, I find the valuation spread between PKG and peers too great to ignore. 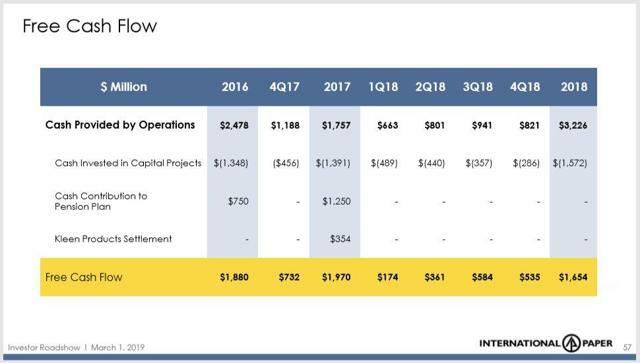 I also believe, over the next year or so, International Paper and WestRock offer better cash flow growth prospects. Please do your own careful due diligence before making any investment decision. This article is not a recommendation to buy or sell any stock. Good luck with all your 2019 investments. Disclosure: I am/we are long IP. I wrote this article myself, and it expresses my own opinions. I am not receiving compensation for it (other than from Seeking Alpha). I have no business relationship with any company whose stock is mentioned in this article.